Vintage cake recipes that you’ll still want to make today! I love all things vintage, and vintage recipes (or old fashioned recipes) are no exception. I think the art of cooking from scratch needs to preserved now and for our future generations. I don’t fault anyone for convenience cooking from time to time but nothing tastes as good, or makes you prouder than presenting a handmade / homemade meal or dessert you’ve prepared start to finish. How to bake a cake at home? If you’ve never baked a cake, without a pre-made mix, it can feel really intimidating. But don’t be! People have been baking from scratch long before super markets existed; you CAN do this! I have a few tips for baking a perfect cake, using vintage cake recipes, or any homemade cake recipe. I know this seems like common knowledge but when you are not accustomed to baking or baking from scratch, you might need a reminder. Even when you grease your pan, you should still line it with parchment paper (NOT WAX PAPER). You’ll never have another cake stick! I prefer this unbleached and chlorine- free brand. You want to know how to make a good and tasty cake at home? The best thing you can do is use fresh ingredients! Old, stale ingredients don’t just taste off, they won’t perform in recipes the way you expect (like batter not rising!). Fully pre-heat your oven. I do this before I even get my ingredients out. You might also want to test your oven temperatures to make sure your oven is reaching (not under or over) the temperature you’ve set. To test your oven temperature hand an oven thermometer from the center or middle rack and pre-heat your oven to 350 ˚F. Allow the oven to heat up for about 20 – 25 minutes. Then take a temperature reading from the thermometer. Then take temperature readings again every 20 – 25 mins for 60 – 90 minutes total. Take your readings and average them out to see how calibrated your oven is to the temperature you’ve set. Ok, I’m not saying you shouldn’t change ingredients to your liking but I don’t advise that in the beginning. Especially if you are new to baking and/or you’re using a recipe for the first time. Try recipes as they are written first and then change up as needed to your tastes and desired outcome. This is very important! These recipes have been used and re-used for decades. Don’t play with the measurements because you may get a cake you really don’t want to eat or share. Unless you’re an experience baker, just follow the vintage cake recipes as they are written. This includes using the pan size called for in the recipe/s. What is the easiest and quickest cake recipe? Well easy and quick vintage cake recipes aren’t really “a thing”. You’re going to have to put some time into baking; but I promise it will be worth it. As you do more homemade baking you’ll find you can move through it faster and with ease. What is your favorite vintage cake recipe? I have to be honest, I don’t eat cake anymore. I have been Keto for almost 2 years. You can see more about that here. But prior to changing my way of eating Old Fashioned Butter Cake with Chocolate Frosting was my absolute favorite, for just about every occasion. Well this isn’t entirely true, I make homemade cakes, occasionally, that fit into my Keto lifestyle. Pre-heat your oven to 350˚F. Grease two 8 inch x 2 inch baking pans (lining with parchment paper is recommended). Add butter, whole milk, and vanilla. Using a hand mixer, beat for 2 – 3 minutes, be sure to scrape down the sides of the bowl with a rubber spatula. Add eggs and beat for 1 – 2 minutes more. Pour batter into prepared pans, dividing equally between the pans. Test for doneness with a toothpick inserted in the middle, if it comes out clean, it’s done. Remove the cakes from the pans and continue cooling on racks, completely. Once cakes are completely cooled, frost with homemade chocolate frosting; or the frosting of your choice. Makes 2 single layer or one double layer cake. Here are some more amazing old fashioned, cook for scratch, cake recipes for you to try at home. Tomato Soup Spice Cake – this recipe dates back to the 1920s or 1930s, depending on who you ask. And it calls for good ‘ol tomato soup. Don’t knock it until you try it! Old Fashioned Peanut Butter Sheet Cake – the perfect pot luck cake. Watergate Cake – we make Watergate salad in my family but this vintage cake recipe for the 1970s takes that to the next level. Buffalo Cake with Lemon Honey – Circa 1914, this is probably not one you’ve tried before! Pig Pickin’ Cake – The perfect picnic cake. This one does use a yellow cake mix, so less homemade than the others. 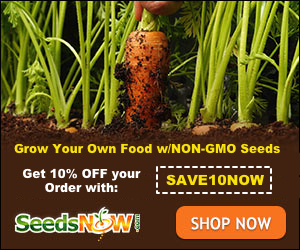 Old Fashioned Carrot Cake Recipe – original recipe is dated 1957! Great Depression Era Chocolate Cake – this cake is made without eggs, milk or butter which were not readily available during the Great Depression. Nana’s Red Earth Cake Recipe – you know when Nanas are cooking, it is going to be good! Queen Elizabeth Cake Recipe – said to date but to Queen Elizabeth the 1st! Old Fashioned Prune Cake Recipe – don’t let the prunes run you off. This is a vintage Southern recipe you’ll want to try. Sweet Potato Pound Cake – a twist on a vintage cake classic. I hope you have to opportunity to make one or all of these amazing vintage cake recipes. They continue to stand the test of time and should be passed down for generations to come. When it comes to comfort foods I think meatloaf recipes are some of my favorite. I have always been a meatloaf fan and converted my husband after we got married. I love the many variations you can make with a basic meatloaf recipe. I’m going to share my family’s favorites because these are truly the best meatloaf recipes out there. Scroll down to see my Taco Meatloaf and my Supreme Pizza Meatloaf recipes. I’m even including a Keto twist on a classic meatloaf recipe for my fellow Keto devotees! What is the best meatloaf recipe? The best meatloaf recipe is the one you’ll eat. No, seriously, that is a loaded question but let’s start with my take on a classic meatloaf recipe that I’ve make for years. What ingredients do I need to prepare meatloaf? This classic meatloaf calls for ground beef, eggs, seasoned bread crumbs, diced onion, salt, pepper and ketchup. 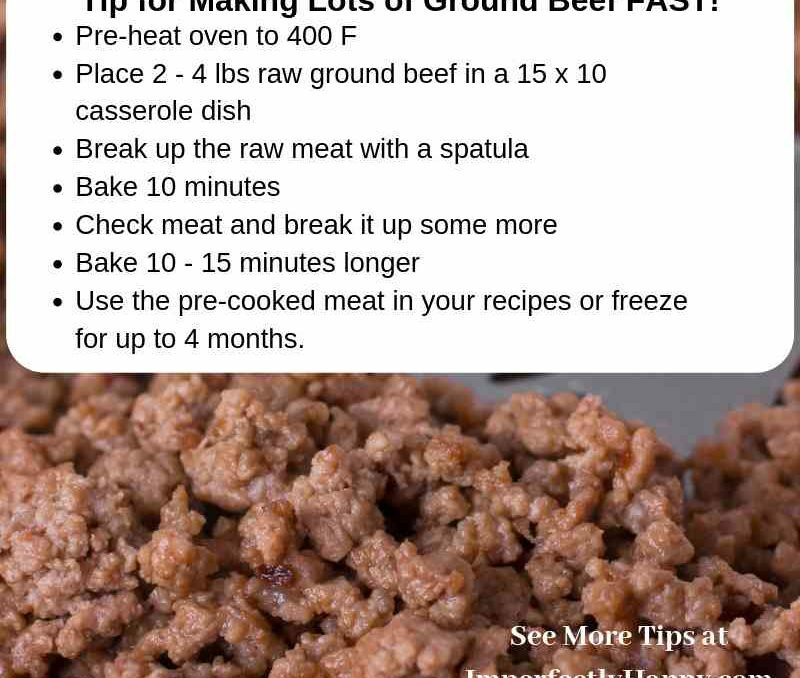 You can change up the ground meats by replacing the ground beef with ground turkey or chicken if you prefer. If you do not have a loaf pan (I like the stoneware type) you can make it in a glass pie dish. It will actually cook faster in the pie dish so check it at 20 minutes, instead of 30 for the 1/2 way point. Why are bread crumbs used in meatloaf? I know I started using bread crumbs in my meatloaf because that is what my grandmother did (monkey see, monkey do). But I know now that bread crumbs act both as a filler and a binder in meatloaf. As a filler – makes a bigger loaf, as a binder – it helps to hold it together. You can replace bread crumbs with crushed corn flakes, panko bread crumbs or even oatmeal (personal I do not like the oatmeal). The first recipe I’ll share is a traditional recipe for meatloaf. This one has been used in my family, and many other, for decades. Sure there are some variations but this will recipe will serve you well. This is an easy meatloaf recipe to make and once you have it down you can play with the ingredients to make it your own! Your basic ingredients are ground beef, onion, eggs, bread crumbs, Worcestershire sauce, salt and pepper with some ketchup for a topping. 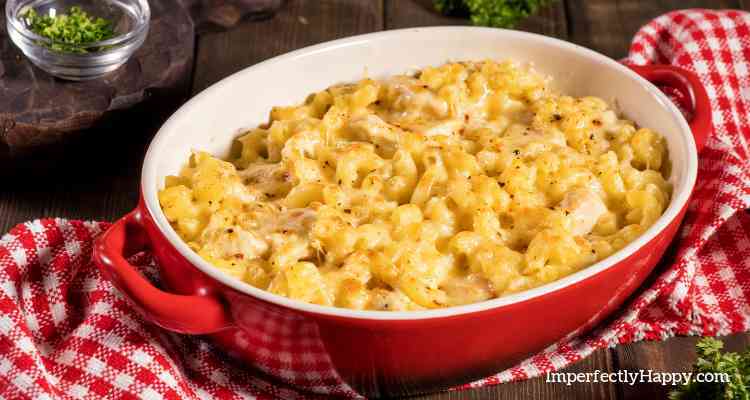 Try making All Natural Mac ‘n Cheese as a side dish. Combine all your ingredients, except the ketchup, in a large mixing bowl. The only way to do this properly is with your hands (clean them first and immediatly after with hot soapy water). Put the meatloaf mixture in a standard loaf pan and make it as even as possible. Bake at 350 for 30 minutes then add your ketchup to the top and bake an additional 30 minutes. Let it rest 10 minutes before slicing. What are some good recipes for meatloaf? Ready to take your meatloaf a little south of the border? This is a little bit of a spin on a classic meatloaf recipe and is great served with salad and Spanish rice or refried beans. In this taco version you’ll need ground beef, onion, bell pepper, eggs, tortilla chips, cumin, chili power, salt, pepper and pepper jack cheese. In a large mixing bowl combine all ingredients (except the cheese), using your hands is best. Put into your loaf pan and make it as even as possible. Bake for 55 minutes then add the shredded pepper jack cheese to the top. Bake an additional 5 minutes or until the cheese is melted and a little brown. I like this Taco Meatloaf served with some sour cream or guacamole! Our next favorite meatloaf is another spin on the basic loaf – the pizza meatloaf! 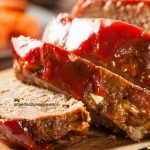 This awesome meatloaf recipe takes all the goodies found on a supreme style pizza and puts in loaf form. This recipe calls for ground beef, Italian sausage, pepperoni, eggs, onion, bell pepper, mushrooms and olives. Of course you need some pizza sauce or marinara and mozzarella cheese too! This one recipe does well in the glass pie dish too for a more pizza feel. Mix your loaf ingredients in a large bowl, for best results use your hands to mix. Put into your loaf pan and make it as even as possible, or use a glass deep dish pie dish for a round pizza look. Bake for 50 minutes (may require less time in pie dish). Now add your toppings of pizza sauce and Mozzarella chees. Bake an additional 10 minutes or until cheese is melted and slightly golden. I have made both the taco and pizza meatloaf since I’ve been Keto, I replace the breadcrumbs with pork rinds or almond flour. Being Keto doesn’t mean we want to miss out on our favorite comfort food! And making a low-carb meatloaf is one of the easier recipes to convert. This is especially good served with my Spaghetti Squash Au Gratin. This recipe uses crushed pork rinds. You can make these in your food processor or just hand crush them. In a hurry you can even buy some pre-made for recipes. I recommend topping this Keto loaf with stevia sweetened ketchup! Mix all loaf ingredients in a large mixing bowl with your hands. Add meat mixture to loaf pan as evenly as possible. 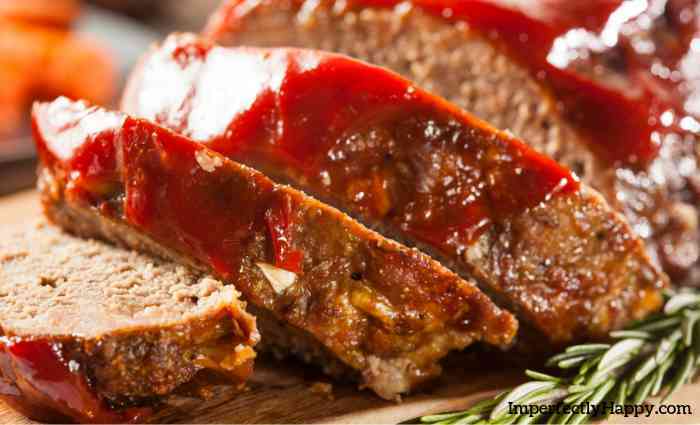 On a busy weeknight a Crock Pot meatloaf can really be a dinner saver! Using the basic or classic recipe, shape your meat into a round or oval shaped loaf and carefully add it to your slow cooker, except for the ketchup topping. Cook low for 6 – 8 hours, in the last 15 minutes add the ketchup. Need a meatloaf fast? Your Instant Pot can do that! Check out this easy Instant Pot Meatloaf that has a 30 minute cook time. I love my air fryer! You can make this Air Fryer Meatloaf pretty fast too! Be sure to check out my Air Fryer Pork Chops and Chicken Wings recipes too. 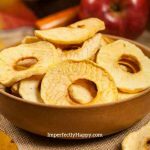 Dehydrating apples at home is easy and they are a great snack to keep on hand. You really don’t need a lot of equipment to dehydrate apples, in fact you can do it right in your kitchen’s oven. But I’ll go over 3 methods for dehydrating apples at home and you choose the one that works best for you! 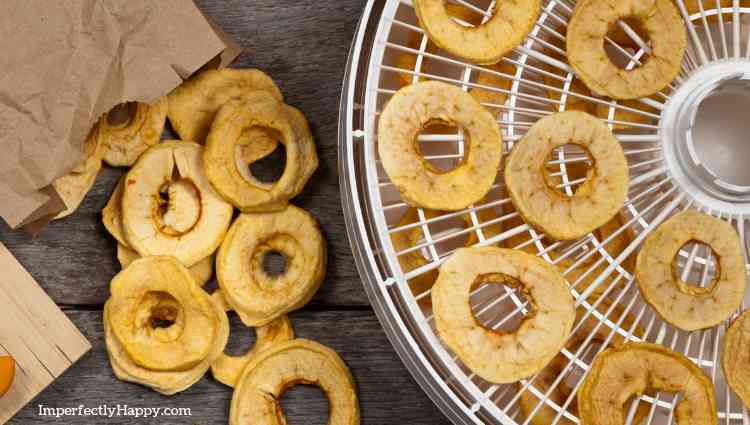 This article will cover making dehydrator apples in a food dehydrator, your oven or a Sun Oven. 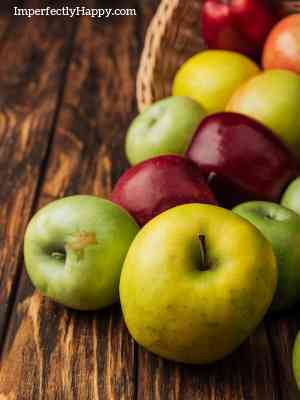 If you’ve never dried or dehydrated food, dehydrating apples is a good place to start. You won’t need a lot of ingredients and the steps are easy to follow. Is it true that an apple a day keeps the doctor away? Well I’m not a doctor or a nutritionist but apples do have some pretty awesome health benefits. According to my research apples can help with digestion, reduce pressure in blood vessels and are a great source of Vitamin C. But you’ll have to decide for yourself if the old saying is true. Are dried apples as healthy as non-dried apples? Well, they do offer you the same vitamins as fresh apples but less fiber per serving. It may take more dehydrated apples to fill you up so be careful, this healthy snack can be packed with a lot of natural sugars! Like most things, a little goes a long way. Are dehydrated foods good for you? It is probably better to choose the fresh variety when available but dried apples and other dried foods are portable and convenient. I love when I make my own dehydrated apples and snacks, I control the ingredients! I like to take dehydrated foods that I’ve made on long walks and hikes too. 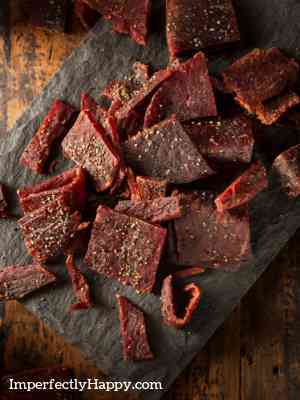 In my opinion dried apples, homemade beef jerky or any dehydrated snack that you make at home will certainly be better than anything from a drive through window or wrapper! How to save lots of apples at home? Use a mandolin slicer to get even slices for all your apples. When I dehydrate apples I like to peel them, but you can leave the peel on. If you are going to dehydrate apples regularly I would recommend investing in a device to peel and core them apples for you. See Apple Peeler / Corer. You can use any variety of apple but I have found that Fuji, Gala, Honeycrisp and Granny Smith are my favorites. No sugar or sweeteners needed! Pre-soaking your apple slices in lemon juice will preserve the color better but it is optional. It is important to make sure the apples are completely dehydrated or they can quickly mold. You can bump up the flavor by sprinkling a little cinnamon on the slices before drying them. This is the most common way to dry apples, using a dehydrator and dehydrator trays. I have been using my Nesco Food Dehydrator for years but I do think it lacks the power of the Excalibur Food Dehydrator. If your budget allows, go for the Excalibur! If you haven’t already was, peel and core your apples. Shake off any access liquid before drying. As you place your apple rings on your dehydrator trays make sure you are not crowding them – the air has to circulate to dry them properly. Dehydrate at 135°F for 6 to 8 hours. Apples are done when there is no moisture inside or out. They’ll feel dry to the touch and leathery. Test the inside by cutting one slice open to dryness. It should be like a dry sponge. Let the apples sit and come to room temperature before storing. Store in an air-tight container, food storage bags or mason jar. Keep your dehydrated apples in a cool, dark area when storing. They should stay good for several months, though we’ve never had to keep them that long because they get eaten fast! If a dehydrator is not in the budget right now or not available to you, you can make dried apples in your kitchen oven. You’ll follow the same directions through number 5 and then changes will need to be made. Place the apple slices on a wire baking sheet and place in the oven. I do not recommend putting them directly on your oven racks unless you give them a really good cleaning first. Set on your oven’s lowest baking temperature and prop the oven door open to allow air to circulate. Baking times will vary on your lowest temp, humidity, etc. But start checking at 5 hours in; they make take up to 8 hours. You can dehydrate apples in any solar oven but I think the Sun Oven is the best on the market. I use it to dehydrate, bake and roast! I love that this method uses no electricity too! Harness the power of the sun for cooking! You’ll follow the first 5 basic steps in my recipe before using your dehydrating racks in the Sun Oven. This video explains dehydrating in the Sun Oven perfectly. Did you know you can also use dehydrated apples in some delicious recipes? Here are a few ideas for you! Add chopped dehydrated apples to your salad for a bit of sweetness. Garnish a hot mug of cider with a ring of dehydrated apple. Mixed chopped dried apples with your favorite nut/s for a sweet and salty snack mix. How do you re-hydrated dried apples? You’ll need a large bowl with enough to hold the dehydrated apples. Fill the bowl up about 1/2 way with room temperature water (allow it to cool down if needed). Put your dried apples slices in the room temp water and make sure they are all under the water. Allow them to soak for about 30 minutes. What are the best dried foods to make at home? Well, of course, I think apples are the best dried food to make! Other dehydrated foods I like to make at home? I’d recommend bananas, beef jerky (homemade can have a lot less sugar), tomatoes, mushrooms, garlic and potatoes. Chicken casserole recipes can make busy weekday meals quick and delicious. I love a one pot meal and chicken casseroles fit the bill on taste, easy to make and budget friendly. I hope you enjoy these casserole recipes as much as we have. The casserole as we know it became popular in the 1950s and 1960s as a food that can be cooked and served in the same dish (the dish itself is often referred to by the same name or casserole dish). I have the original set of casserole dishes I got at my wedding almost 24 years ago! Most dictionaries define it as a kind of stew or side dish that is cooked slowly in an oven. Many people, me included, consider a casserole to be a comfort food. Anyway you define casserole, you’re going to love these chicken casserole recipes! What are some good side dishes for a chicken casserole? Good side dishes for a chicken casserole will depend greatly on what ingredients are in the casserole itself to begin with. But here are a few ideas for casserole side dishes. Would it be okay to use beef in a chicken casserole recipe? Most casserole recipes are pretty flexible and you could easily replace ground beef or even leftover roast / steak in for chicken. You might find you prefer beef instead of chicken! What can you make with leftover chicken? Because you are going to used cooked chicken in almost all chicken casserole recipes they are a great way to use leftover chicken. And you can pick up a rotisserie chicken at the store to make these recipes even faster. What is a good chicken casserole recipe? A good chicken recipe, in my opinion, is not only tasty but quick and easy to make. This is not fancy but good homemade food that you can make fast but still feel proud to serve. 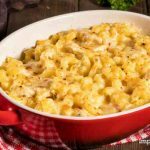 I am including my recipe for Chicken Mac ‘n Cheese Casserole today but below you’ll also find links to many other fantastic chicken casserole recipes to try (I’ve included some of the best around for you!). Have a weekly casserole night and try them all! Cook your elbow macaroni to al dente, check the package directions on time. You do not want your pasta fully cooked or it will be overdone. While the pasta is cooking use about 1 tablespoon of butter to grease your baking dish. In a large pot melt the remaining 4 tablespoons of butter on a medium heat (do not brown or burn). Whisk in your flour and spices and continuing whisking until the mixture is thickened. Turn your burner to high to bring this mixture to a boil (stirring often). Allow it to boil 1 minute and then remove it from the heat. Stir your sharp cheddar and Monterrey Jack cheese into the pot and stir until completely melted. Add in your cooked chicken and macaroni and stir until the sauce covers everything. Pour into your prepared casserole dish. Baked 30 – 35 minutes or until the casserole is bubbly and slightly golden on top. I recommend NOT using pre-shredded cheese. It is coasted with starch to keep it from sticking and doesn’t melt as well as shredding your own. You can vary your cheeses to change up the recipe. I love it with all Pepper Jack Cheese or subbing 1/2 to 1 cup with a smoked Gouda. You can use a store-bought rotisserie chicken or leftover chicken for this recipe too. To make in a truly one-dish meal you can add in some chopped broccoli before cooking. Other Amazing Chicken Casserole Recipes to Try! Fiesta Chicken Casserole Recipe – take your chicken casserole recipe south of the border! Traditional Chicken & Rice Casserole – made with cream of mushroom soup. Chicken Cordon Bleu Casserole – this one isn’t as fast but worth your time! King Ranch Chicken Casserole – a family favorite every time. Cheesy Crack Chicken Casserole – pot luck requested! Chicken Pot Pie Casserole – one pot meal perfection. Italian Chicken Casserole – another great pasta inspired dish! Chicken and Stuffing Casserole – ultimate comfort food. Chicken Shepherd’s Pie Casserole – did someone say mashed potatoes? See MORE Casserole Recipes Here! Casserole Baking Dish – a good glass 13 x 9 baking dish is a kitchen essential but I also love enameled cast iron. Casserole Travel – Casseroles are perfect for pot lucks are when taking a sick friend a meal. Having an insulated carrying case is so helpful! Cheese Shredder – I know shredding your own cheese takes more time, but it does make for a better melt and recipe! I use a standard, old-fashioned box grater.